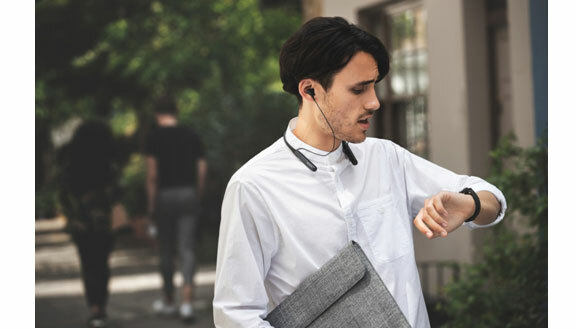 New Delhi, 25th February, 2019 – Further elevating the immersive audio experience, Sony today unveiled its latest addition to its family of wireless noise cancelling headphones, the new WI-C600N neckband headphones. No Lengthy wires, no noise, the WI-C600N Headphones are made for everyday commuting, the WI-C600N comes jam-packed with superior wireless sound quality and noise cancelling features. Digital noise cancellation with One Push Artificial Intelligence Noise-Cancelling (AINC) lets you listen to nothing but your music when you’re on the move. Whether it is travelling on a crowded train or on a long bus journey, Sony’s noise cancelling technology eliminates loud distractions to give you a peaceful commute. Keeping out the clamour of the outside world, you will never miss a beat with the WI-C600N and fully indulge in your favourite music. You can also choose to let in surrounding ambient sound by activating the Ambient Sound Mode which lets in just the right amount of outside noise to keep users aware of their surroundings while still enjoying your favourite tunes. Switch easily between Noise Cancelling and Ambient Sound Mode with a simple push of a button. The WI-C600N comes equipped with DSEE (Digital Sound Enhancement Engine), a technology developed by Sony which enhances the sound quality of compressed audio files by restoring high-range sound removed by the compression process. The WI-C600N promises the same crystal-clear sound that Sony fans have come to know and love. The headphone is perfectly engineered to enhance comfort for prolonged use. The impressively light-weight neck band weighs approx. 34 g and fits securely and is made with an elastic material to improve wearing comfort, making them ideal for all-day wear and can be stored effortlessly in a bag. The neckband offers 6.5-hours battery with noise cancellation turned on and 7.5-hours battery with noise cancellation turned off. One can stay deep in their playlist, with up to 6.5 hours of non-stop music. Making the journey more enjoyable without wires the noise-cancelling neckband lets user to fully immerse in their favourite music. WI-C600N also offers compact 6-mm drivers keeping the earphones small for a comfortable fit, while still delivering great overall sound. The magnetic housing also cleverly snaps the earbuds in place to keep tangled cords at bay. With the WI-C600N, users can go completely hands-free while making calls or listening to music as it comes with a built-in microphone and is compatible with Google Assistant and Siri. One can enjoy entertainment on the go, connect with friends, get information, listen to music and notifications, set reminders, and more with the help of this feature. The WI-C600N also supports one-touch listening so users can instantly stream their favourite music via Bluetooth® with just a tap from their smartphone on the NFC™ logo of WI-C600N. One can set the perfect sound for every song and tune the headphones with the free Sony Headphones Connect App for Android and iOS. WI-C600N will be available across all Sony Centers and major electronic stores in India. Sony | Headphones Connect APP is needed. Google Assistant app needs to be installed on iPhone. Google is a trademark of Google LLC. The Google Assistant is not available in all countries and languages. Requires pairing with eligible phone and internet connection.